It’s easy entertaining to mingle with neighbours at a potluck party! Plan a potluck and form friendships at a casual, relaxed and fun gathering. The fun of a potluck party is that the pressure is not entirely on the hostess since everyone attending brings a dish or beverage to share. It’s an easy way to entertain, and an excellent way to gather your neighbours and get to know each other better. The secret to a great potluck is a little organisation so you don’t end up with a dozen varieties of mac and cheese. Make the guest list and choose the date and time, then make some calls to organise the food! As the hostess of the party, dig out extra platters and serving pieces and provide eating utensils. A potluck is casual, so it’s perfectly appropriate to use sturdy plastic if you don’t have enough flatwear to go around. Based on the size of the guest list, it’s up to you how much you can provide over and above the party space, utensils and napkins. Sometimes the hostess prefers to provide the main course, such as a roasted turkey or hamburgers on the grill, while the guests fill in with beverages, salads, sides and dessert. Do have an extra bag of ice and some plastic cups ready as part of your contribution. Don’t leave the menu to random chance! If you don’t want to risk every guest bringing a salad, ask each person what they’d prefer to bring and offer some options. Based on the group size, you’ll need several salads, a variety of side dishes and a selection of desserts and beverages. Even people who don’t cook at all can pitch in with deli items and take-out, condiments, juices, sodas or wine. Be prepared to make helpful suggestions when asked. Keep in mind that all dishes should be prepared in advance. As hostess, you won’t find it convenient to have guests chopping veggies for salad in your busy kitchen. Nobody should do more in your kitchen than pop something in the oven or microwave a dish for reheating. 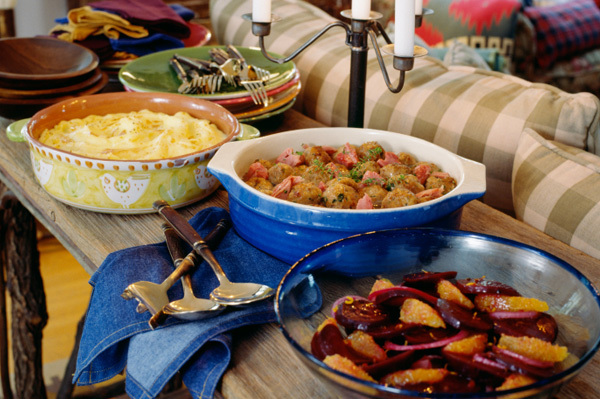 Traditional potluck dishes include casseroles, chili, bar cookies, salads and breads. Desserts like cobbler and brownies are always popular at a potluck. Remember that these dishes don’t have to be of a serving size to feed a crowd. You should have enough variety that everyone can fill up on smaller portions by sampling a large number of dishes. Consider some easy finger-foods that guests might like to provide as hors d’oeuvres: stuffed celery sticks, chips and dip or deviled eggs. An old-fashioned potluck party is a great way to meet, greet and mingle with your neighbours and form friendships in a casual and relaxed gathering.